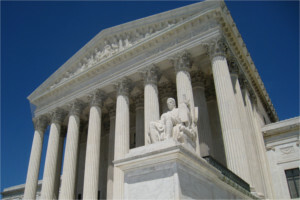 Forcing government workers to pay agency fees to unions violates the First Amen dment rights of those who choose not to be in a union, the U.S. Supreme Court ruled today. The news website Politico reports that the justices ruled 5-4 against an Illinois law, saying it violates public employees’ right not to back union activity because it required all workers to pay agency fees. “The decision overturns a 41-year-old precedent in which the court unanimously found that such charges did not run afoul of the Constitution’s free-speech and free-association rights,” the article said. Alito was joined by Justices John Roberts, Anthony Kennedy, Clarence Thomas and Neil Gorsuch. Associate Justice Elena Kagan wrote the dissenting opinion; she was joined by Ruth Bader Ginsberg, Stephen Beyer and Sonia Sotomayor.